Few names bring the golf equipment fans to their knees quite like Bettinardi, and THP has been anxiously awaiting the new 2011 line from this famous craftsman. Today was that lucky day as a rather large package arrived at THP HQ and inside was a medley of the 2011 line to show off the incredible “art” that Bettinardi is putting out this year. 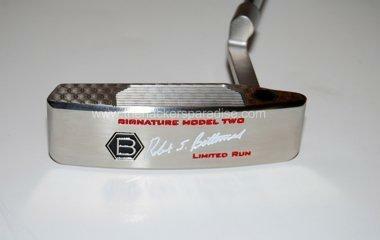 Here is a the THP first look at the new putters coming from Bettinardi Golf. – Milled from our propriety fusion of the softest carbon steel with special ingredients to insure a unique and quality feel upon impact. – Beautiful, paint filled graphics to compliment this stunning finish. – Durable finish that will not corrode, discolor or tarnish. – Milled Single Sight Line. – Bettinardi/WINN Grip. Standard or Mid-sized Grip Available. – Available in 340g and 355g head weights. – Beautiful, paint filled graphics to compliment this dramatic finish. – Available in a 345g head weight. – Milled from our proprietary Double Aged Stainless Steel. – The Bettinardi “Tour Finish” has a subtlety muted appearance and is lightly sanded and polished by master technicians. 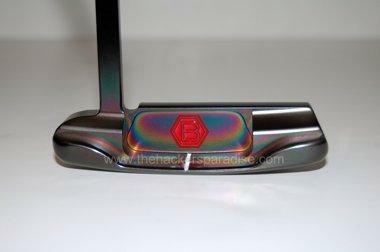 It has a bead blast top line and body to reduce all glare while showing the beauty, precision and detail of the putter. 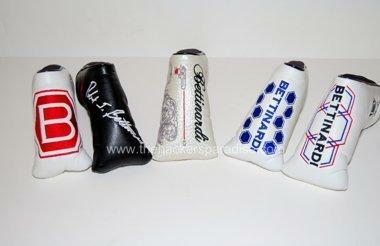 – Bettinardi/Grip Master black leather grip. Standard or Mid-sized Grip Available. Bettinardi is pleased to introduce the Robert J. Bettinardi, Limited Edition, 50 Caliber Putter in celebration of Robert’s 50th Birthday. The Bettinardi 50 Caliber has a beautifully modified, classic style Anser head, made from 303 – DASS (Double Aged Stainless Steel). Each putter has 50 intricately placed copper plugs inserted into the head by hand. 46 copper plugs are presented on the Honeycomb™ face, 2 on the heel bumper and 2 on the toe bumper. The Bettinardi Hex B Logo has an elegant script engraving on the face with additional elegant script engravings on the neck, in the pocket and on the sole. It presents with a plummer neck with a full shaft offset. Each 50 Caliber comes with a True Temper shaft and a Bettinardi leather grip by Grip Master. Each putter is accompanied by a specialty headcover which has a pearl metallic finish with black, silver and red script stitching. The final presentation is Pure Class – Pure Bettinardi. Numerous milling stages – including the elaborate, detailed engraving, intricately placed copper plugs, hand polishing and final finishing make this limited edition, celebration putter the true collectable. Only 100, numbered, 50 Caliber putters will be presented in celebration of this special occasion – Robert J. Bettinardi’s 50th Birthday! For TONS more pictures (Large Hi-Res) and information of the entire 2011 lineup, check out the THP Forum thread on the new line by clicking the link below. These are a work of art. 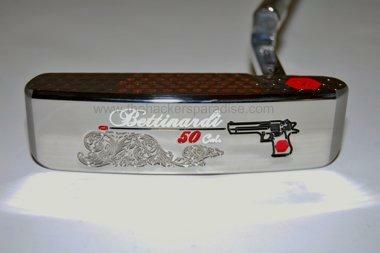 Bettinardi you make incredible putters!!! I will be buying one for sure. Hands down the prettiest putters I’ve ever seen! Can’t wait until you test and review them! Well done Bettinardi! You guy’s just pulled a rabbit out of the hat during a time when people are not spending money and there’s a ton of talent in the field, yet you will sell every one of these in a hurry. Fantastic products, the envy of anyone who see’s one and these are not just wall hangers, they putt lights out. Great job and Congrats on the new line! whoa! those are too pretty to game! hahaha. I think i like the 50 cal best. I’m fired up!!! 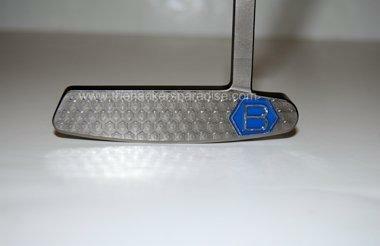 I’ve ordered one of the 2011 BB Series. I have to tell you they are much prettier than the picture. They absolutely are a work of art. I was getting my putting stroke computer analyzed and picked this putter up to give a try while doing so. OMG just an incredible feel and look to this putter. Needless to say I ordered one. I like the other two Odyssey putters I have but this putter takes it to the next level. Congrats to Bettinardi. Awesome just awesome!!! Can you give me a price on the #7 mallet.In the studio line. I am now the proud owner of a Model BB-27. Had the effective loft changed a little bit and bent to my needs. The balance and feel are incredible not to mention the looks. Unfortunately the golf season is over here but have something to look forward to next year!!! Do you mind if I quote a few of your articles as long as I provide credit and sources back to your weblog? My blog is in the very same area of interest as yours and my users would definitely benefit from a lot of the information you present here. Please let me know if this alright with you. Thanks!